Join the discussion on our forums! Come discuss Spirit of the Shark over in our dedicated Spirit of the Shark discussion topic. Does Cursed Castaway draw Spirit of the Shark ? 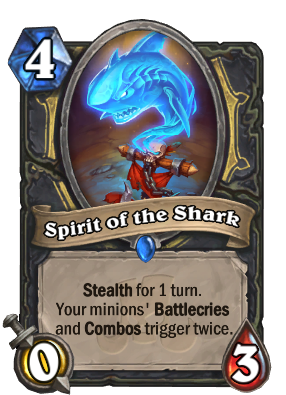 No, since Spirit of the Shark is not a combo card. Couldn't find the best synergy with this and this deck but figured I'd give it a try. Might be better in a different archetype though. am I the only one who feels like this spirit has the least conneciton to its loa? I mean yeah, using this with Gral will get you twice the benefit...and twice the downside after the inevitable silence. That being said, it's still a really strong card with ...just about anything but Gral. Amazing card - can be run instead of Brann in any Rogue wild deck. very cool. how would the interaction with say Myra Rotspring work? gain 2 deathrattle cards and she gains both effects?? Proof that card rarity is 100% arbitrary. Better version of a past Legendary, now as a Rare! it'S not a better version at all and it'S class specific. You all seem to be severely underestimating that stealth. It practically guarantees that you'll be able to run a huge combo off it the next turn, whereas Brann was so likely to die the same turn you played it that you could only reliably play it late game with smaller cards on the same turn. And you can have two of them. It also applies to Combo cards. Some of which are incredibly strong, like Vancleef.